I am currently spending some time in Barcelona, once again on occasion of the Primavera festival. 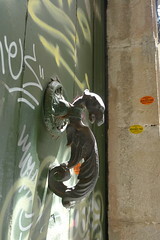 Whilst in the narrow, winding streets of the old town, I noticed a marmot-shaped door knocker on one door. This immediately brought to mind the French idiomatic expression croquer le marmot (to stand hesitantly at a door with one's hand over the door knocker, without following through), marmot-shaped door knockers presumably being customary in those days. This expression was, of course, memorably gifted to the English language as “to craunch the marmoset” by Pedro Carolino, the non-English-speaking Portuguese author of English As She Is Spoke, an unintentionally surreal (and, needless to say, entirely unusable) Portuguese-English phrasebook. A contemporary equivalent of craunching the marmoset would presumably involve hovering over the SEND button in one's email client or something similar. There are no comments yet on "To craunch the marmoset"